Dr. Aric Welton completed his undergraduate education at Texas A&M University with a Bachelor of Science degree in microbiology. He also received three years of further education and experience at the Department of Ophthalmology at Baylor College of Medicine, where he went on to work for the Lions Eye Bank of Texas for several more years. Dr. Welton continued his post-graduate education at the University of Houston College of Optometry. His externship clinical training was done at Brooke Army Medical Center at Fort Sam Houston in San Antonio, Texas. Further clinical training was held at the Hermann Eye Center of University of Texas Medical School in Houston, with a focus on glaucoma and contact lens fitting. 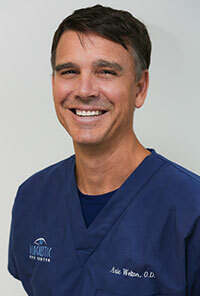 Dr. Welton has been with Diagnostic Eye Center since 2001. He specializes in fitting contact lenses of all types and has served as a clinical investigator for contact lens research studies of new materials and care products.